An International Space Station camera caught sight of the Soyuz space capsule as it made its approach to the orbiting outpost on March 28, 2013. A Soyuz rocket successfully delivered a trio of new residents to the International Space Station on the first-ever "express" flight to the orbiting laboratory. 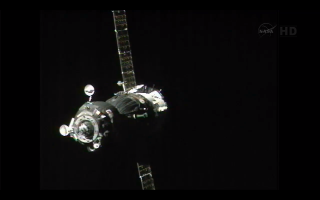 The Russian rocket carrying NASA astronaut Chris Cassidy and Russian cosmonauts Alexander Misurkin and Pavel Vinogradov docked with the station on time at 10:28 p.m. EDT (0228 March 29 GMT) while both spacecraft flew high over the Pacific Ocean after a history-making six-hour flight. The International Space Station comes into view for the crew of a Spacecraft on March 28, 2013. "Expedition 35 now has a six member crew on board the space station,"NASA spokesman Josh Byerly said during the space agency's live comentary of the docking. It has been a long day for the crew. Because of the launch's accelerated timescale, Misurkin, Vinogradov and Cassidy will not have had the chance to rest for 20 hours by the time they settle in for the first night in their new home. Before now, manned trips to the space station have taken at least two days, but with the docking of this ship just six hours after liftoff, marks the beginning of a new kind of mission that saves time and money, NASA officials have said. Expedition 35 Russian Flight Engineer Alexander Misurkin, top, NASA Flight Engineer Chris Cassidy, and Soyuz Commander Pavel Vinogradov, bottom, wave farewell from the base of the Soyuz rocket at the Baikonur Cosmodrome in Baikonur, Kazakhstan, Friday, March 29, 2013. Their Soyuz TMA-08M rocket launched at 2:43 a.m. local time. "In my opinion, our mission is just next little step on the way, on the way to the moon, Mars, and I am very happy to do this step," Misurkin said in a preflight interview with NASA. Russia's unmanned Progress cargo ships have made these express dockings before, but using the method for a crewed flight prevents the spaceflyers from spending extra time in a crowded capsule. Officials with the NASA also explained that these trips save money because a quicker flight means that Mission Control personnel will be on duty for a shorter amount of time. The three newest residents of the International Space Station have a jam-packed stay ahead of them. A Russian Progress cargo spacecraft is scheduled to dock with the station at the end of May, and the crewmembers will perform spacewalks as well as help run the more than 100 science experiments while on board. "We as human beings, we like to explore; there’s frontiers of knowledge, there’s frontiers of physical space that I think we all just feel compelled to go to and each one of those different types of environments, be it space or high mountains or the water, all bring different aspects to what we can learn, what can we can bring back to better life in either a small spectrum of our lives or in the broader sense of it," Cassidy said during an interview with NASA. "That’s how I think the space program is." The three other residents of the station — Canadian astronaut Chris Hadfield, Tom Marshburn of NASA and Russian cosmonaut Roman Romanenko — will fly back to Earth in May. Vinogradov is set to take command upon their departure. Cassidy was a crewmember on board the STS-127 space shuttle mission in 2009. Vinogradov flew to the Russian Mir space station in 1997 and the International Space Station in 2006. This is Misurkin's first time in orbit.